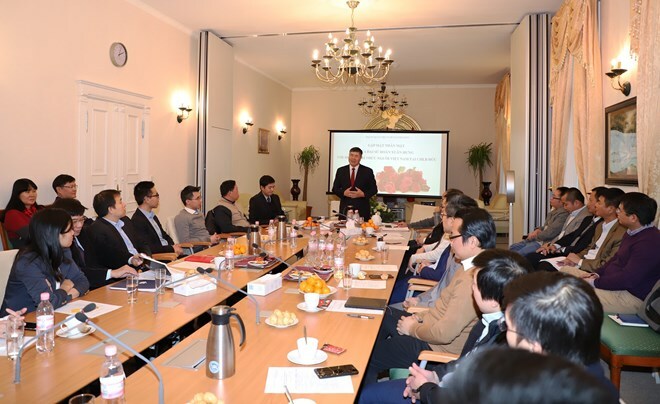 Vietnamese Ambassador to Germany Doan Xuan Hung hosted a get-together for Vietnamese intellectuals working and studying in the country in Berlin on November 30. Speaking to the many Vietnamese professors, doctors, scientists and students from various universities, research centres and top companies of Germany and other German-speaking countries who participated in the event, Ambassador Hung proposed a series of topics for them to discuss, focusing on ways through which they can intensify their contributions to their homeland. The Party and State always pay attention to, call on and create the best conditions for intellectuals living in foreign countries to contribute to the national development of Vietnam, the diplomat reiterated. Participating scientists held that many Vietnamese have become successful in Germany and gained rich experiences in sciences and realities. This is a “soft power” of the Vietnamese in Germany, and the question now is how to further mobilize this valuable resource to the development of Vietnam in the new context, they stressed. At the event, many scientists shared their experiences in finding financial resources for scientific research and application projects for Vietnam. Participants also agreed on the establishment of a board taking charge of the preparations for the coming into being of the Vietnamese Intellectuals’ Association in Germany.